Truly one of the best kept secrets in all of NL. Every September we make a trek across the island and The Riverwood Inn is not just our first place to stay but our favourite by a wide margin.The rooms are tastefully finished with luxury and your comfort is foremost.If you want a quiet romantic getaway , you've found it, if you want a peaceful spa feel getaway , you've found it or if you just enjoy a really nice place , you've also found it.Every suite/room is different....depending on what you may want or need. The beds are very comfortable and there are plenty of fluffy white towels waiting for you. Everything is very very clean , from the main floor areas to the washrooms to your floors and beds. If you want you can preorder a delicious evening meal. The staff are super friendly and proud to show you around. There are great walking trails around the area and there is a beautiful trail right outside the doors. This Inn should be on your bucket list , you will not regret it. Serena and Staff gave us the wedding of our dreams. Beautiful rooms, amazing food (thank you to the cook Dallas). The Beaver coming right out of water on our wedding day was pretty neat. Highly recommend booking your wedding here!!!! Really enjoyed our stay this past weekend. The staff are the friendliest bunch I have ever encountered. The bed in our suite was a little uncomfortable and there was a leak in our closet but because we enjoyed everything else so much we wouldn't complain. We will be back in the future when we need to get away from town for some relaxation! The property is just beautiful, breath taking scenery. The rooms are very elegant, the staff are so friendly and helpful. We came for a 3 night stay and by the end of our first night, we were already planning our next trip back. We did a lot of hiking, touring and sight seeing. We actually have stayed at Riverwood Inn 3 times so far and are planning many more trips back in the future. Recommend anyone and everyone to stay at this Inn! The room was lovely, however the breakfast service was very poor, and did not meet the standards of most basic B and B's. there is so much potential to provide a continental breakfast in the lobby, rather than leaving a basket in the room at check in. Very cheaply done. We were not impressed with the gumdrop muffins! It would not have been difficult to have a basket of homemade muffins with NL berries and croissants. For the price of the rooms,we were not impressed. Also, not one piece of information or pamphlet in the room or lobby promoting the area. No one at the desk either. Appears to e more about hosting wedding parties on the weekends. I hope you will try and make improvements for the sake of our tourists. Great facility, but very lacking in meeting tourism industry standards. Webmaster's reply : Hi Heather and John and thank you for your valuable feedback. We partially agree with your assessment of the breakfast basket and have since your visit decided to implement a Continental breakfast in our spectacular great room for guests during the busy peak season. We will also consider the Continental option during the less busy seasons but we have to weigh this option against the practicalities of lower occupancy and business (and guest) convenience. With regards to your comments as to the lack of literature regarding the regions attraction's and offerings I humbly agree that we need such information but I suggest that is a criticism to be voiced with the tax supported Tourism agencies active throughout the province rather than expecting a sole business to generate such regionally supportive material's and literature? Unfortunately, as a business we have to focus on Riverwood and not that of the region but I agree pamphlets, maps, etc. should be made readily available to tourists visiting our region. And finally as to your criticism of no one on the front desk, we have a hostess on duty 12 hrs per day during peak season but as a small private business we need to get full utility of that position meaning our people need to multi-task and take care of other chores while on duty, however, they are a bell ding or cell phone call away. To operate a 11 -room facility of this calibre takes hard work and dedication of my Management and Staff but I admit we cannot offer the full services of a hotel in Toronto or a B&B in Vermont which have different market realities than Riverwood. However I do believe we offer the best combination of accommodation, service and natural location of any Inn in Atlantic Canada and I suggest the 99.9% positive commentary and 2011 distinction of Accommodator of the Year verifies this. We look forward to seeing you two in the future and again thanks so much for the valuable feedback. Sincerely, Chad & Jenny Wells (Proud Owners). Staff go out of their way to help you! The property is beautiful, and the rooms are elegant. Couldn't ask or wish for anything more, it was perfect! Special Thank you to the staff of the Riverwood Inn for accomodating our family on short notice when our Dad passed away on March 7. We were all able to congretate at the Inn on the evenng after the funeral and visit with all of the family together and to get our Mom out of the house into a different environment. 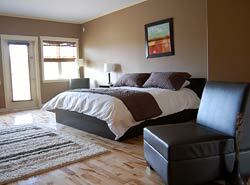 Beautiful rooms.....we will definitely return on our next visit to NFLD. Great place to stay!! 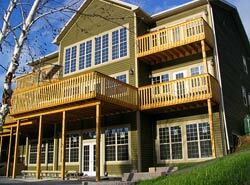 We thoroughly enjoyed our three night stay at Riverwood. The setting, the accommodations were only surpassed by the wonderful staff - a big thank you to Tracy who goes the extra mile to ensure you have a fabulous stay! 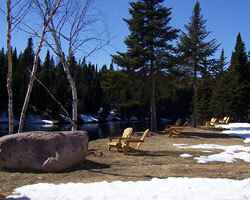 A great place for a get away, to unwind and just enjoy the beauty of the setting.